The 38th Boat Show in Dusseldorf was chosen by Custom line as the platform to introduce its new 26 metre semi planing motor yacht. The project was carried out by the engineering division of Advanced Yacht Technology (AYT) in collaboration with Zuccon International Projects. 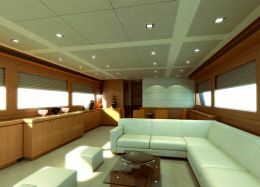 The interiors, of the yacht in composite, may be shaped entirely to the owner's liking from the outlay of the interiors to the furniture, its fabric and the general décor. The main deck features a saloon with a dining area for ten and a galley with a small saloon for the crew. The owner's master cabin is at its bows and the standard décor foresees two small armchairs with a retractable table, a large wardrobe and a bathroom area with a separate shower. From the galley, one descends into the crew quarters where there are two double cabins for four with two bathrooms. 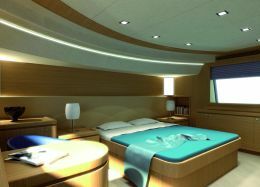 The guests' cabins, instead, are on the lower deck and the project offers two possibilities for these. Version "A" provides for two large "Vip suites" complete of a walk in wardrobe and en-suite plus another cabin with twin beds. Choice "B" comprises a second twin bed cabin in addition to the two "Vip suites." The areas to relax in are concentrated on the top deck and moving from the bows towards the stern, aside from the wheelhouse at full beam, one may encounter a saloon with a panoramic view, an "L" shaped sofa and a low table in it, which thanks to a retractable window glazing system gives onto the outer part of the deck. Here, on the outside, one may relax in the sun on a variety of sun pads, sofas and even prepare a barbecue. On the exterior of the main deck there'll be a cockpit with sofa. All nav. instruments are last generation supported by a Gi8 touch screen control system and Mitsubishi ARG stabilisers. For further information please contact: Custom Line, Via Ansaldo 9/B, Zona Industriale Villa Selva, 47100 Forlì. Tel: +39.0543.474411. Fax: fax +39. 0543.782410. 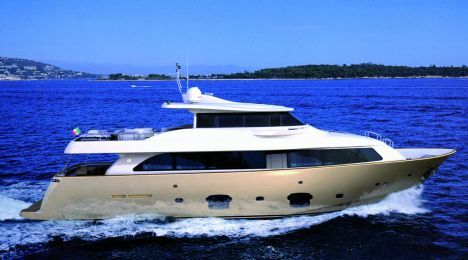 Web page: www.customline- yacht.com.